2 weekends, 2 great photo shoots, 3 fantastic models. 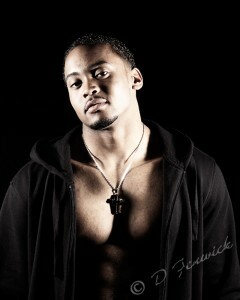 On the 6th I had a great opportunity to shoot with Nikko and Phil, two local models. We did a couples shoot and experimented with several lighting and prop setups. We started in the studio and then moved outdoors to catch a few shots before evening set. There’s just no substitution for a street shoot – in my small studio anyway! Overall it was a really good shoot, and I learned to keep skin lotion handy for those shiny skin photos. Both models were great to work with and I’d highly recommend them. I also shot a few photos of Phil, they came out edgy and I think the lighting worked well. Phil likes them too. On the 12th I shot with Velvet Bernhard, also local. Although she wasn’t feeling well, kudos to Velvet for her professionalism in keeping the appointment and smiling thru the multitude of poses. We only shot for an hour or so, but we got some good photos and I appreciate her cheerful disposition despite being under the weather. We did both pinup and head shots. We’re hoping to get together again soon to do some more headshots/beauty work and some fantasy makeup. That should be a lot of fun! I would recommend you take the chance to work with Velvet if the opportunity arises. She’s a great model, great attitude and good sense of humor. For the pinup and headshots I also had a makeup artist present. Nena, who has modeled for me before, is a professional makeup artist and came by to add her talents to the shoot. She is a lot of fun to work with and does fabulous work. I’d highly recommend hiring her for your shoot whether you’re the photographer or the model. Project52 is moving right along. The assignment for Valentines was Chocolate. This was a fun shoot. My wife and I tried a couple of options for it. The cake shots came out really nice as did the chocolate and strawberries. The splash in the chocolate was shot separately so I could clean the spatters off of the tabletop between shots. 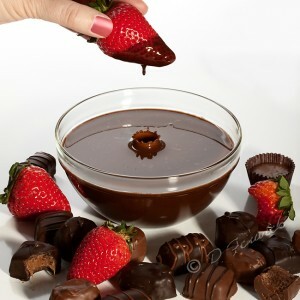 The hand and strawberry is another image, shot over the bowl of chocolate without moving anything, including the camera. The strawberries and chocolate on the table were added and another image made. All three photos were then layered in Photoshop to give the final image you see above. Since all of the images were taken without moving anything, lining the images up simply required getting them into a single file, as layers, in Photoshop. All I had to do was move the hand and strawberry a little so the drop lined up with the splash. If you’re wondering how I managed to get the splash in chocolate syrup, it wasn’t too hard. I did have to thin out the chocolate syrup 50% with water, straight out of the can it was too thick to get a splash. Once it was thinned out I used a little bottle with a dropper tip to drop single drops of chocolate into the bowl. Lining them up was interesting, but I got a few that were pretty well centered. The worst part was cleaning the spatters off of the table top. The little drops dry very rapidly and are dark enough to show in the pictures very clearly. The final result was well worth the effort as you can see.